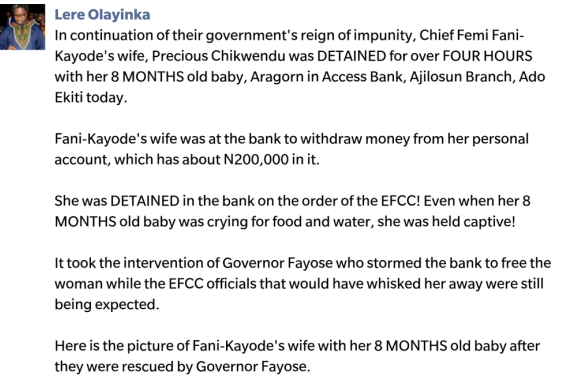 How EFCC arrested Fani Kayode's wife at Ekiti Bank and allegedly brutalised her. 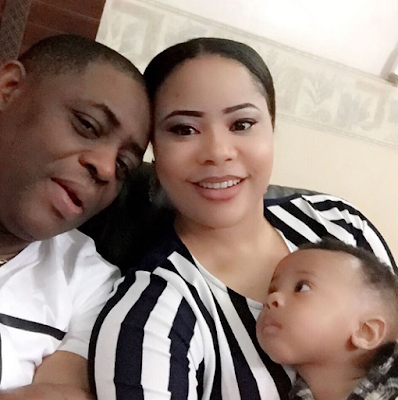 The Femi Fani Kayode wife arrested and detained by EFCC at a bank in Ekiti headlines, is the latest stand off between FFK and the Buhari government.Well at least that is the way FFK and Ayo Fayose percieves the situation.According to Fani Kayode,his wife had been visiting Ayo Fayose in Ekiti state and stopped at a bank to withdraw some money.Somebody must have tipped off the EFCC because they stormed the bank and allegedly detained or arrested Precious.Fani Kayode says his wife was brutalised as a result of the arrest by EFCC officials. Personally i find that hard to believe.Why would they wanna brutalise a woman with an 8 month old baby? EFCC and then headed to the bank to rescue her. This govt is sick and cowardly and so are the EFCC. If you have a problem with me face me and leave my family alone. My wife traveled to Ado Ekiti to see my friend and brother Governor Fayose and his family. They were on their way out of town when they went to Access Bank in Ado Ekiti to get some money. 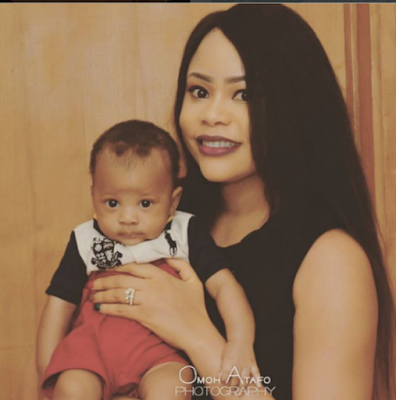 When they got there my 8 month old son Aragorn and wife Precious Chikwendu were illegally detained, brutalised and put under arrest on the orders of the EFCC at a bank in Ado Ekiti today. This is Buhari's Nigeria and we will resist his wickedness and tyranny. We intend to sue the bank and to sue the EFCC for this illegal and wicked action. They have no right to do this. If they want to see my wife all they need to do is to invite her. We have nothing to fear. They do not need to be so primitive and barbaric to people.